26 years of sharing a house with this Parrot and I should know better. Starting off the day with my Glenn Miller addiction reawakened by a friend online, I turned on the internet radio and selected a Swing music station on Sirius XM. It's about the only reason why I bother with Sirius because their modern dance format stations are way too tightly programmed with small variety. I made sure the volume on the radio was low enough to keep my old feathered friend quiet. Oscar will get loud and "sing" along with what ever was in the house at the moment so he's my hearing protector. 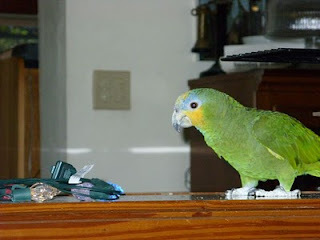 It is a challenge to balance listening volume with the noises of the room at a level that won't trip the Parrot Alarm. Heading into the Kitchen I knew I was done for. There was not enough coffee for the day. Sure, there were enough Grounds roasted the day before to make one mug, but not enough for the second. Putting 1/2 cup of green beans into the popcorn popper, the lid was replaced and a deep breath was drawn. It was going to get loud. Just after the 7AM noise limits it was safe to turn everything on. The kettle warmed to boil water for Mug One as the beans were beginning to roast in the Popper. Glenn Miller was now drowned out. Hello! Hello! BreakerBreakerBreakerBREAKER! (jungle noices) (unintelligeable grumbles) BahBahBahBahWOOWOO! May as well entertain the dog, the parrot is now at full volume. Grabbing the almost empty peanut butter jar sets Lettie off barking. It's a large plastic jar that I have scraped almost all of the peanut butter out of. The top is screwed down way too tightly for her to easily get off. It also is way too large for her to grab comfortably. Place the jar on the floor among the symphony of the growing popper, the jungle noises, and the Glenn Miller winding down in the next room, I am treated to my beautiful "Non Barky" dog begging for her "toy". My foot goes down toward the jar (BARK!) and with toe of the sneaker, I tread downward on the plastic. It spins madly and careens off of the wall and under the now totally excited dog who is trying hard to keep up with the random motion. Parrot is now loudly chattering "here we go! here we go!" and the water on the kettle now is at a full boil screaming into the morning. Pour out two cups boiling water exactly into the waiting coffee grounds, stir quickly to break the surface tension and reach over to replace the kettle on the stove to cool. Looking over at Mrs Dog, it is time to take one then another step toward the peanut butter jar. Sensing that, Lettie barks off 3 loud MWOOFS! and the jar is set into another drunken drive around the floor tiles. Oscar is loving it and laughs a loud cartoonish laugh. At this point the noise level hits its final crescendo as the timer goes off and the popcorn popper is unplugged. Beans are poured onto a plate to cool, Oscar goes silent in a sudden stop, and I can actually hear Ella Mae Morse singing sweetly to me from over top of the stove. Giving the coffee one last stir, Lettie's peanut butter jar is now spun one last time giving her one last reason to bark at it rolling around on the floor. The house goes quiet. It is time to have the morning coffee. After all, 10 minutes have gone by.